African Flowers are my favorite motifs in crocheting. I notice that flower hexagons are the most popular, but there is only a little information about pentagonal ones. You may ask “do I really need learn this new pattern?” The answer is a resounding yes, you do, if you like to make 3D crochet projects with african flowers motifs. The African Flower Pentagon will be used in every difficult ‘moment’ to shape the toy as it should be. Look at the photos below. After an in-depth look, you can notice that the pentagon areas were used very frequently to make this beautiful “happypotamus” (The Happy Hippo) and fewer, but still necessary, to bring together the shape of this cute sheep (Miss Wooly). If you are here, that likely means you need to use this pattern! The lower photo shows the diagram of flower pentagon. You will find the link to the video tutorial and free patterns below. African Flower Pentagon – Free Crochet Pattern is >>here<<. 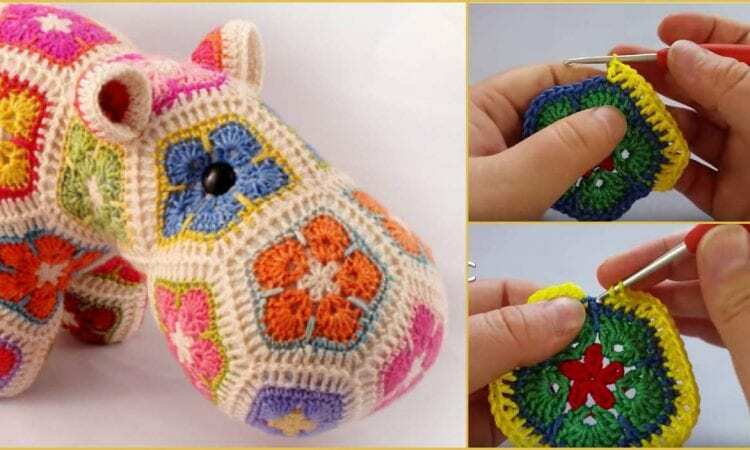 To show you how to use the pentagon, I used photos of Happypotamus, the Happy Hippo created by Heidi Bears (if you are interested in that pattern you can buy it here), and Miss Wooly by Woolytoons (you can find the pattern here). Don’t forget to Like us on Facebook. Share your ideas and your work on our Facebook group!